"After this, we [Paul and Luke] started on our way up to Jerusalem. Some of the disciples from Caesarea accompanied us and brought us to the home of Mnason, where we were to stay. He was a man from Cyprus and one of the old disciples" (Acts 21:15, 16). Saint Mnason was a native of Tamasos in Cyprus and a child of idolaters. When he grew up his parents sent him together with his friend Theonas to Rome to settle the dispute that existed at that time between the Cypriot pagans of Politiko and the village of Pera as to which patron pagan god was the greatest. In Rome the two friends met some of the Apostles who were of the Seventy that had fled to Rome following the stoning of Stephen in Jerusalem, and from them they were taught about Jesus Christ. The few things they heard about the new religion was enough to inflame within them a deep desire to know about it even more. For this reason they shortened their stay in Rome and went to Jerusalem. Their journey had one purpose: to meet the chief apostle Peter and John the Evangelist, of whom they heard many good things and were told could teach them more things about their beloved Jesus. Their well-born desire, with the help of God, was awarded richly in the Holy City. Here the two friends met the "beloved disciple", John the Theologian, and from him they learned of the entire life and teaching of the Lord. In the end, after receiving Holy Baptism, they returned to their native Cyprus. As they arrived in Cyprus, to their great joy they were informed that the apostles Barnabas and Mark and Paul had come some time prior and undertook a difficult journey to enlighten the darkened souls. With the help of the Holy Spirit, Mnason went to various parts to catch up with them. One morning his labors were rewarded. 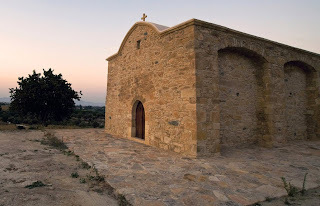 Mnason met the apostles with the newly-illumined Bishop of Tamasos, Saint Herakleidos, in a cave, and Mnason, "one of the old disciples", became a companion and assistant to Herakleidos. From the cave in Tamasos, in which the two disciples and their companions initially settled, they began their salvific mission, and this resulted in the "word of the Cross" becoming a source of comfort and hope for weary hearts. Their fiery preaching was aided by their living example of a holy life, and their many miracles added daily new souls to the number of the early Church. God graced Saint Mnason richly with the gift of wonderworking. From his Life we learn how one day the Saint left the cave in which he was staying and entered the city. As he was passing by the beauteous Temple of Asklepios, in the center of the city of Tamasos, and he saw the statues of the gods, the soul of Mnason became indignant at the predicament of his countrymen as well as the entire ancient world, for the idols of the nations are made of silver and gold and are the work of human hands. Looking at the white marble of the Temple and the glittering statue of Asklepios in its midst, he cried out: "In the name of Jesus Christ, the Son and Word of the true God, I command you to fall and be crushed." He hardly finished saying this and the miracle happened. Both the statue of Asklepios and the Temple were demolished at the same time and fell to pieces. The pseudo-priests who were there watched this and ran with tears to tell the Greek pagans what they saw. With indignation they set out to capture the Saint and kill him. But the fiery missionary did not lose it. With the courage of the Christian faith that flooded his soul, he remained unruffled, looked straight into the eyes of the furious crowd, and he blew at them. Young and old at once stopped and began to cry with pain: "Our eyes! Our sight! We lost our sight! Take pity on us, man! We believe in your God! Forgive us and make us well!" The Saint heard their requests and was quick to respond. He gave them their sight back and sealed each one of them with the sign of the Cross, and then he baptized them. There were about three hundred people in total. A large part of the rest of the life of Saint Mnason is associated with the life of Saint Herakleidos, the first bishop of Tamasos. They initially lived together in the same cave, which they also used as a church. Mnason then constructed his own cell next to the cell of Herakleidos. But they officiated together and prayed together. Mnason willingly helped him and was a loyal and devoted follower. Herakleidos undertook a missionary journey to Paphos, and Mnason willingly followed him and supported him in every sacred work. And in the performance of miracles, as it is written in his sacred service, he did not lag behind in the least from his Holy Teacher. Saint Mnason resurrected Trophime, the mother of Aetius, who because of her deep sorrow over the death of her son to the bite of a snake, hit her head against the wall and fell dead. Saint Herakleidos raised the boy. Another time he resurrected from the grave another dead person that resulted in four hundred pagans believing and being baptized that same day. He shut the mouth of a wayward debt collector, who one day grabbed a faithful brother and sought to strange him to get back the money he had given him. Saint Mnason took his hand and sweetly told him: "Leave him, my child, and I will return to you whatever you gave him." The wayward but nefarious debt collector, who saw others like him approaching, instead of letting go of his victim, began to push him more and blasphemed the Lord. To the insults and blasphemies of the hard-hearted and unjust Alexander - this was the name of the debt collector - the Saint said: "Your lawless mouth, that has insulted and blasphemed the Creator, will remain dumb and closed. And the hand that attacks and seeks to harm the innocent, will be withered." He had not yet finished saying this when the lawless and abusive Alexander received his punishment. Alexander remained dumb and withered. This miracle frightened the bystanders. Some even rushed to declare their faith in the God of the Saint. Among them was a man named Gelasios, who believed with his entire household and they were baptized. Alexander followed their example. Tears ran from his eyes and dampened his garments and in various ways he asked for the mercy of God. The Saint pitied him. He forgave him, healed him and finally had him baptized. One day the Saint went to the village of Pera, and he found the river to be high in water. Standing there he said a prayer, and after making the sign of the Cross the waters separated and the Saint crossed to the other side like the Prophet Elijah, and he remained dry. He healed the blind and the possessed. He calmed a storm and prevented a shipwreck. In times of drought he prayed, and the heavenly vaults opened and beneficial rain fell. 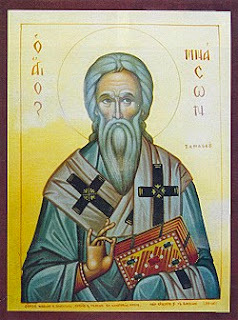 Saint Mnason succeeded his teacher Saint Herakleidos to the episcopal throne of Tamasos. With persistence and a will of steel, with his preaching and miracles, the army of the followers of Christ increased daily and the light of the new life unfolded with his activities throughout the troubled island. The salvific work of the Saint continued into his old age. When the time came for him to depart this world and go to heaven, he called all his disciples near him, and after giving them helpful advice he ordered them not to sorrow. He also ordained after a common vote his successor Rhodon to be the third bishop of Tamasos. Three days after these events, on the 19th of October, the holy soul of the humble bishop departed this life and went to heaven. Upon hearing of this sad death the multitudes rushed from all parts to bid their farewell to their father and embrace his relics for the last time. During this last embrace the blind were able to see again, the lame walked again, and the demons departed from the possessed. His disciples buried his holy body reverently next to the body of Saint Herakleidos. Later the respect of Christians towards this great Saint led them to build a Monastery near the grave of the Saint, which today no longer exists. Only a small church remains from its former glory. The Russian monk and traveler Basil Barsky in his travels through Cyprus in 1735 states that the Monastery was in operation with six monks.